Places | Indian Stocks & markets, Real Estate, Personal Finance – What I see, read and think you find it here. I took a week off to go to Valparai, a hill station on the Anaimudi range and couple of other places over the last week. Valparai is close to Coimbatore and it is one of the lesser known tourist places when compared to Kodaikonal, Ooty, Yercaud etc., Valparai is 3500 feet above sea level and dominated by tea estates. Top-slip – why somebody should visit? We took the Cheran Express from Chennai and got down at Tiruppur. We have arranged for a pick up vehicle from Tiruppur to take us to Valparai. Enroute to Valparai, we covered couple of places like Masaniamman Koil and Top Slip. Top Slip is highly over-rated tourist spot, I guess. Absolutely there is nothing to see, no good restaurants for food. But everyone keeps telling that Top-slip is a fantastic place. I don’t know why somebody should visit Top-Slip. We stayed in a company’s Officers club of Bombay Burmah Trading Corporation (BBTC), which is called as Mudi’s club. Valparai is still lives in the British Raj style with clubs for officers/managers who are working in the tea estates. 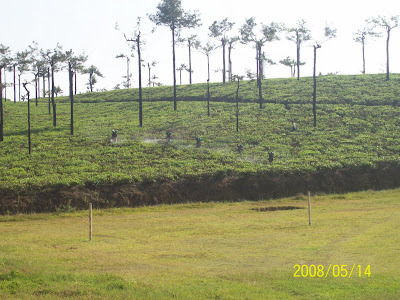 The companies which owns tea estates in Valparai and surrounding places are Tata Coffee, Jaishree Tea (BK Birla Group), BBTC (was told that it is still owned by an Englishman partially!! ), Karamalai tea estate etc., As we stayed in the club which belonged to BBTC, we found out that there are more than 10000 employees of that company in Valparai and surrounding areas. The place were we stayed has a beautiful view of tea estates. In spite of being peak summer season, the climate was very pleasant. Mudi’s club, provides you with a kind of dormitory facility. There are no separate rooms but couple of big rooms where all are accomodated. It is suitable if you go in a group of say 10 to 15 people and who can stay together. The club has decent size cricket ground and where the company’s managers/officers play cricket. When I said that they still British Raj style prevails is because of the fact that these officers/managers are still referred as “management” by the locals and labourers. Valparai doesnot boast of tourist attractions similar to Kodai or Ooty. Couple of places to visit in Valparai includes the Balaji temple, Sholayar Dam, any tea processing factory (which we did), Cincona falls etc., It is an ideal place for somebody to go and relax for a couple of days. We stayed in Valparai for couple of days and moved to Udumalaipet and then Coimbatore for a day each. On the way down from Valparai, we visited places like Tirumurthy Falls, Monkey falls, Aaliyar dam, Oneness Temple at Aaliyar (Vazhga Valamudam group). We stayed at Udumalaipet for a night. A family room at Udumalaipet costs Rs500/- with 2 extra persons accomodated. Quite a decent bargain, I guess. The last leg of the tour is towards Coimbatore visiting places like Pattiswaram, Echanari Vinayagar Temple, Isha Ashram (Jaggi Vasudev’s) and a private Balaji Temple at Karamadai run by the owners of KG Denim group. We were really worried if we would be able to make in time to Coimbatore after the Balaji Temple for our train at 10.00 PM. Karamadai is some 35 kms from Coimbatore and by the time we left the temple, it was already 8.15 PM. Luckily there was no big traffic snarls on the Coimbatore – Mettupalayam road and we could reach the station in time for the train. Vandalur Zoo – A must see place for children!! Being in Chennai for many years now, gives me a kind of complacence in exploring places closer to the city. One such place I visited couple of weeks back, breaking my complacence is Vandalur Zoo. Three weeks back (Sept 22-23) I visited Eagleton Resort in Bangalore along with my colleagues. 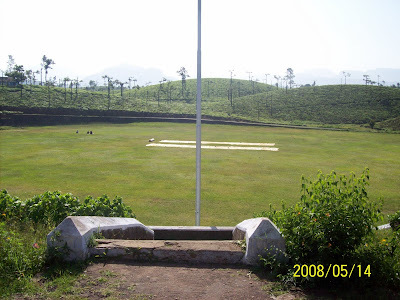 Eagleton resort is a very picturesque place with a hill as a backdrop and a beautiful lush green golf course. It is located on the Bangalore – Mysore Highway and it is 30 kms from Bangalore Majestic spread over 550 acres. I had less than a day to spend at the resort with a packed schedule of fun activities in the evening and followed by the India – Australia Semi-final of the Twenty 20 world cup. The evening was spent having fun games and little bit of dance. It was a wonderful match which India won. We are now facing the music of the Australians in India for that win in Twenty20 world cup!! The next morning I went around the resort. The resort has 18 hole PGA standard golf course. The golf course was well maintained and was very huge. There were lot of foreigners who were playing golf. I was surprised at the high number of korean-looking faces among the foreigners. Are there many Koreans in Bangalore? The resort has all the facilities like swimming pool, spa, healthclub, gymnasium, conference halls, banquet halls etc., There are many indoor games like shuttle, table tennis and squash. They also have a room to play darts. While going around I saw some independent houses and when I enquired I found that there were plots which are developed and sold by the resort owners. I was told that the ongoing land rate is around Rs2300/- s.ft. Not for me, I left it at that!!! The owner of the resort is from Andhra Pradesh, I was told. Eagleton resort provides a perfect ambience for a quiet weekend for a busy corporate exective in a very beautiful environment which would help to rejuvenate the mind and the body. I totally enjoyed my visit and decided to comeback someother time. It is an ideal weekend gateway for the Bangalore guys. PS: The room tariffs are little expensive starting from Rs6000/- for a single occupancy. You can visit them online at http://www.eagletonindia.com/. I am also loading few snaps taken at Eagleton.